The tension in the air was thick as I stood, among 2,500 elite athletes from around the world, on the beach of Mirror Lake for the swim start of Ironman Lake Placid. 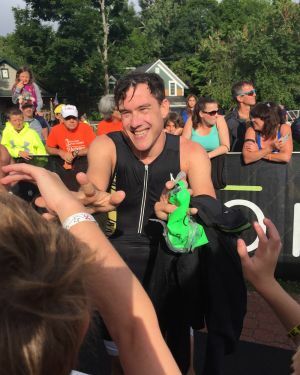 As I stood on the sand, I felt the support of so many, and knew that in the next 15 hours, I would learn so much about myself as I attempted to complete the 2.4 mile swim, 112 mile mountainous bike course, and 26.2 mile marathon – my first triathlon. Would I be able to finish with the sore knee I had been franticly trying to heal over the past few weeks? As I trained for this moment and shared my story of overcoming the fear of stigma surrounding my depression over the past months, I have heard from so many people around the country. Many are struggling themselves, or have a family member with mental illness. Others have recovered, many through a treatment program that included exercise and healthier food choices. 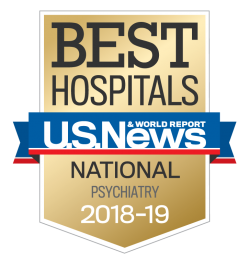 All have found inspiration or a sense of community as they came out of the shadows and faced up to the stigma they felt from others or themselves. One thing that my training has taught me is that self-care is critical. To perform your best, you have to sleep, stretch, eat well, and be tuned in to your body and respect the messages it is sending you. For me, this was a challenge. I am used to setting goals and following the plan. The weekend of July 4th featured my last series of big workouts before beginning to taper down my efforts to heal and save energy for the race. But as I set out on my run that weekend, I felt my right knee ache, a nagging injury. I ignored my body’s messages, and proceeded to run 16 miles of hills when what I should have done was listen to my body and go home and ice my knee. The next three weeks prior to race day were spent leaving no stone unturned in my efforts to heal before the biggest race of my life. With the swim behind me, I flew down the mountain roads, the deep lakes unfurling on my right as my bike accelerated past 45 miles per hour on the long descent. Would my knee hold up? I would find out over the next few hours as I made my way back up these mountains. I cycled conservatively, working hard not to over-exert myself. As I made the turn up the long climb back to Lake Placid, I let my left leg do the work as I carried my right knee along for the ride. Once the run started it would be totally exposed, but for now, I could let other parts of my body help it along. The marathon course at Lake Placid takes you through town, where the cow bell-ringing crowds and costume-clad fans lend you their energy. The far part of the marathon is along a stunning mountain river, where, between aid stations, you are alone with your thoughts as everyone is working desperately to finish. By mile 15 of the marathon my thoughts were so muddled I thought that something about the day had cured my knee pain. I didn’t feel it at all! But the truth was that so many other parts of me were in pain by that point, my knee was so far down the list of woe that it just didn’t register any longer. As I made the turn back to town, I strung aid stations together, trying to run between them and walk through them. The friendly faces I saw among the volunteers there (and the chicken broth they started to serve as the sun went down!) got me through those last grueling miles. As I reflect on this intense experience, I realize that I have learned so much. In order to perform your best, you have to take care of yourself. Training and racing in an extreme sporting event magnified this in a way that finally drove home for me a lesson I try to impart to all my patients: you must put your needs first to be able to perform your best. So many people I know, patients and friends alike, put themselves so far down their own priority list. What they don’t realize is that with a good self-care regimen, they will have more to give to all of life’s endeavors and the people they love. I also learned that I couldn’t have crossed the finish line alone. By engaging with my family, the Sheppard Pratt community, and making my race about something outside of myself, I was able to accomplish something that seemed at first impossible. Even those smiling volunteers at the aid stations played a critical role in keeping me going. Allowing them in, something that wouldn’t have even occurred to me in the past, enabled me to draw strength from them, far beyond what I was capable of individually.